The changing face of Woking | Curchod & Co. The regeneration of Woking town centre has been gathering pace during 2018 with the Victoria Square development now dominating the town’s skyline as it heads for completion in 2020. The scheme is dominated by two apartment towers of up to 34-stories high, providing 429 apartments, and a 23-storey Hilton Hotel that will provide 189 rooms, conference facilities and a bar offering panoramic views of Woking and the countryside beyond. The regeneration includes 125,000 sq ft of commercial and retail space in Woking that will be anchored by a new Marks & Spencer store along with car parking, a medical centre and public open spaces. The refurbishment of Victoria Gate, a landmark building in the town centre, has also recently been completed and it was revealed at the end of October that Aviva Investors had let the entire 65,000 sq ft building to the McLaren Group on a 20-year lease. Further office space is due to be provided via the Space development, located between Victoria Way and Chertsey Road the scheme is due for completion in 2021 and will provide 86,000sq.ft of Grade A office space. At Woking One – a major scheme opposite the railway station – Spaces, the provider of co-working office accommodation, has agreed a ten-year lease on almost 40,000 sq ft of offices of Grade A office space. The accommodation was pre-let while the building was under construction at a rent reported as equating to £32 per sq ft. Once open it will be Woking’s largest co-working facility. Other schemes currently under construction include the regeneration of the Former St Dunston’s Church site that will provide over 140 apartments and around 5,300 sq ft of commercial space. Construction started on the scheme, being developed by Galliford Try, in early 2018. Further plans announced in recent months include the redevelopment of Concord House, located on Church Street East. 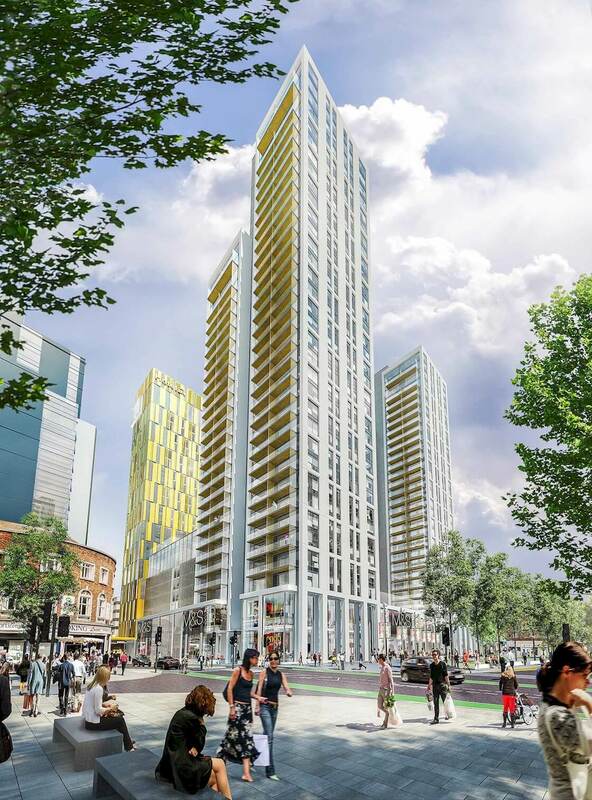 The proposal is for the construction of a mixed-use development comprising two 34-storey buildings to include 174 flats and a five-storey office building of approximately 25,000 sq ft. The application is currently under consideration by Woking Borough Council. Future planned developments include the Woking Gateway project, located adjacent to Victoria Square. The scheme will comprise approximately 476 apartments in three towers and around 47,500 sq ft of commercial space. Construction is due to start in 2021. Coplan are Woking Borough Council’s development partner and work is currently underway on the site’s planning permission. As part of the town centre’s regeneration, major highways improvements will also be undertaken to reduce congestion. In September, Woking Borough Council introduced its proposal for the widening of Victoria Arch and the removal of the one-way system along Guildford Road and Victoria Road, to provide two-way access. Outside of the town centre, Woking residents are benefiting from the development of new amenities such as the recently constructed Hoe Valley School, athletics track and leisure facilities. The school opened in September 2018.